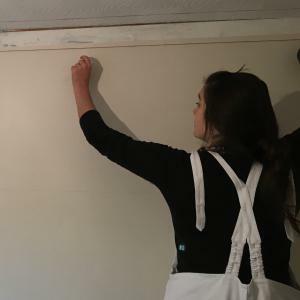 Jo’s route to a Construction Apprenticeship began with an Art & Design course at East Surrey College, she enjoyed the creative freedom and decided to join the Level 1 Painting & Decorating course at College. Whilst on the course, someone recommended doing an Apprenticeship with Epsom-based company Mercer & Mercer, with whom she began a Level 2 Apprenticeship. Now on a Level 3 Apprenticeship, Jo finds that studying whilst working gives her “the upper hand, you get more product knowledge and can combine this with projects at work!” When asked about why she chose the construction industry, Jo shared that “there’s a great sense of camaraderie – it really gets you through the day!" Jo described her decision to do an Apprenticeship as "easy!" - "It's a cheaper option, and you get an official qualification which opens up more career paths." Her plan for the future is to continue into more specialist finishes with an aim to work in scenery painting.